Matakana Link Road plated in gold? 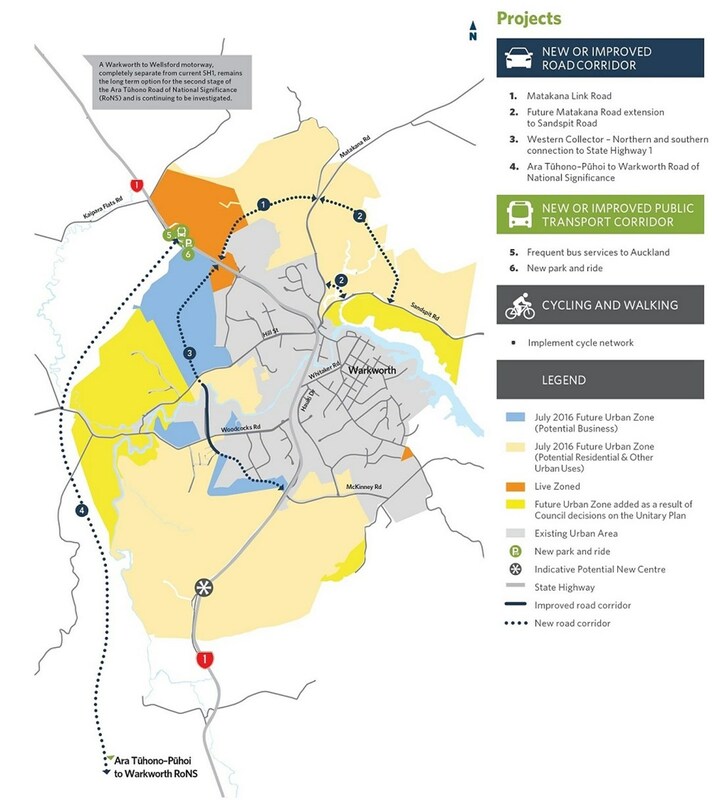 The Auckland Transport Alignment Project (ATAP) and the draft Regional Land Transport Plan (RLTP) represent a significant improvement over previous plans, having a much greater focus on walking and cycling projects. There are however still a lot of projects unfunded. Programmes like bus priority measures and cycling are only seeing a portion of the funding they need. With so much that needs to be done, it’s important to ensure we’re getting good value out of projects. 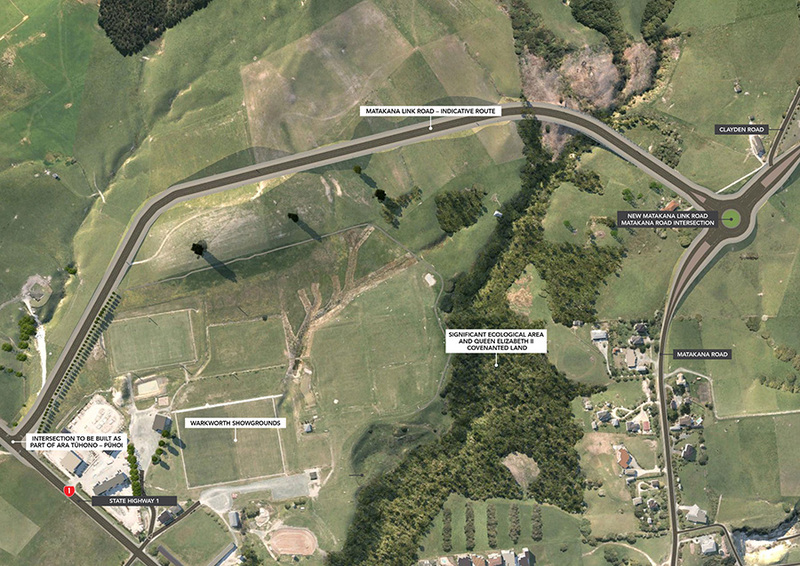 One project it appears we might not be getting good value out of is the Matakana Link Rd. One of the main justifications for building the huge Puhoi to Warkworth motorway project was to allow traffic to bypass Warkworth. However, the reality is much of the traffic isn’t heading further north towards Northland but to holiday areas such as Omaha to the East and Northeast of Warkworth. That means significant amounts of traffic would still be needing to flow through the notorious Hill St intersection. The Matakana Link Rd is intended to act as a bypass for that traffic, thereby helping the Hill St intersection work better. It also sits in the middle of an area designated for future development and to act as part of a future arterial ring road in Warkworth, so in future won’t just be about through traffic – hence why it doesn’t connect directly to the end of the motorway. Auckland Transport’s intention is it to open at about the same time as the Puhoi to Warkworth Motorway, which is due for completion in 2021. However I’ve noticed something which seems off with the project. The draft RLTP which was consulted on recently lists the project as costing $89 million. In a time when it’s not uncommon to see projects in the billions it may not seem like much but when you break it down, it’s stupidly expensive. Here’s what AT say about the road. MLR will be approximately 1.4km long. It will be a 50km/hr urban arterial road. Dedicated off road walking and cycling facilities. Below are some indicative cross-sections of what is planned. Given it could be decades before the surrounding land is actually developed, there’ll be the situation where a four-lane urban road complete with protected cycle lanes and footpaths will existing in the middle of farmland, connecting two rural two lane roads that don’t even have a footpath. Puhoi to Warkworth – 18.5km through some very ruggard countryside with massive earthworks and bridges – $709.5 million or $38m per km. Huntly Bypass – 15.2km including 3.5 million m³ of earthworks and a 60m cutting through the Taupiri range – $458 million or $30m per km. Hamilton Bypass – 21km and includes 17 bridges – $973 million or $46m per km. Cambridge Bypass – 16km and has a 230m bridge spanning a river – $218 million or $13.5m per km. How does a “50km/hr road”, through what appears to be relatively flat ground, end up costing considerably more per kilometre than motorway projects through some of the trickiest terrain in the country? I also looked at other projects such as Penlink, Tauranga Eastern Link and the Kapiti Expressway. None come close to the cost per km suggested for this project. Auckland Transport have decided to plate the project in gold. If it has more than doubled then that’s extremely serious and AT need to answer has happened. AT have quietly changed the scope of the project and are hoping to use the extra money allocated for another of the projects shown on the map at the same time. In the rush to create ATAP and redo the RLTP someone has put the wrong figure in. I think the third option is the most likely and if true, hopefully means the extra $50 million can go towards some of the currently unfunded projects in the RLTP. Some top candidates for that extra cash could include closing the gap on cyclings missing millions and/or rolling out more bus lanes. Hmm so this is basically a ring road scheme. Bad new for the people looking for relief from traffic queues. Also a frequent bus route to Auckland, really? Some peak services I could understand but frequent? Thats a shedload of buses and cost, wonder if that is actually funded or not. Hope that bus actually serves the town too, not just a park and ride by the motorway. AT now putting ‘improved bus services’ in nearly every road business case as per Penlink? That’s a bit of a rort, isn’t it? The improved bus services should be happening anyway, not something that should support a business case for a road. Just thought I’d share some observations about that holiday traffic: It has grown as a result of the extra road capacity on SH1, so that now people go for daytrips to Matakana, and holiday homes in Omaha have multiple late-model cars parked outside. No “packing the family into the car” to go away for the weekend or holiday anymore, now it’s everyone makes their own way their in their own time. At the same time, bus services have improved slightly. There is now a private commuter bus. And there’s a shopper’s bus Warkworth to Omaha. But if you’re trying to go to the beaches by bus, chances are you’ll not have much choice of time of day or a 2 hour wait in Warkworth. If I was to put some money into transport in the area it would be to improve access for both locals and holiday goers by public transport and cycling so people can bypass the SOV queues. So we can probably assume, then, that the $89m wasn’t an error, then. That’s a lot of money to shift the congestion to Matakana. That is easy to answer. Auckland Transport have these informal ad-hoc committees of people representing every aspect of transport who come together at the beginning of projects, with each one of them demanding that their area of interest gets a project that fulfils whatever daft policies they have managed to get past the AT board. Fairly quickly it becomes obvious that none of them will back down so we end up with a project that includes two of everything. Well that’s how it has costed out. I would say ~50% would be land take – BUT AT could argue betterment in most cases and therefore pay less or nothing as it opens up the northern areas for development (which believe me is ready and waiting for the road to go through). We shouldn’t forget the large permanent communities at Snells Beach and Algies Bay, they also get served by this road. But it is a very wide corridor currently – you could narrow it down and take out the walking and cycling but then it would be difficult and expensive to add later due to the earthworks. Those are very steep, unstable hills! Just goes to show how low the ~$30k development contribution fee actually is, especially in sprawlville. It would take ~3000 new properties just to pay for this one road. 3000 new properties would more than double the population of Warkworth – just to pay for one road. Am I right in thinking they’re not actually taking the opportunity to concurrently block the Matakana Rd between Sandspit Rd and this link road? So some traffic will still do what it does now; the link road will simply add capacity, and thus traffic? The Sandspit Rd / Matakana Rd / Elizabeth St / Millstream Pl / Hill St / SH1 intersections is very dangerous. Following the GPS priorities for safety and access as top priorities, then environment and value-for-money, means attending to the safety issues, probably with traffic lights that prioritise pedestrians, adding in cycling infrastructure and bus priority. Trying to attend to congestion presents a poor value-for-money way to attempt to increase access, given that anything you do will just fill up with traffic. This scheme suggests to me that humans aren’t capable of evolution in thought. I think you are right Heidi. The idea seems to be to build another road that requires you to drive further and which requires you to then give way at a roundabout to people who used the existing shorter road. As for evolution of thought, it looks more like some sort of generative disease at play here. But hey look at all that planting! Generative disease, love it! That’s my new word for NZ transport planning. Does anyone know the distances of the two routes? Would be interesting to calculate how much faster you have to drive for the motorway to be quicker! The toll road will be just 700m shorter than the existing SH1 and reduce travel time to the north of Warkworth by just three minutes compared to the current journey time. Most Warkworth residents will find the new toll road won’t be quicker (and in some cases slower) than the existing SH1. That a very good way to look at what we get from spending nearly $1b on a new road. The major benefit obviously for Puhoi-Warkworth is a separated median, and given the motorway will likely be tolled for the indefinite future I don’t mind paying for the additional safety to prevent another driver driving head on into me. I bet most Warkworth bound traffic ( locals etce tc)w stick to the current road. That’s a 17 min time saving though. We are talking less than 3 min for Warkworth residents. This seems very common in Auckland – lets find a multi million dollar solution we will implement in 20 years time because we can’t possibly make a few people drive a little further or park across the road. Surely the cost difference is the land isn’t it. The majority of the land in the comparison projects is cheap farmland, not highly expensive land near Warkworth. Why does the MLR need to be four lanes when Matakana Road is only two? Bart, if they were to cut the Matakana Rd as I suggested, and provide just one lane each way, this road, for its massive cost, would at least simplify and take the pressure off the big intersection. As they are proposing it, with two lanes in each direction, and the existing route remaining in place, it will “ease congestion” by providing more capacity. This will induce traffic. People put off taking the extra car for the weekend or going to Omaha to surf for the day by the horrible queueing at that intersection will now do so. The volume on the road will increase. And the new roundabout, then Matakana, will see the queues develop. There’ll be more people popping into Warkworth by car. Safety and walkability in Matakana and Warkworth and probably other areas will decrease. Although I think we would all like to be able to go to Omaha easily wouldn’t we? The only reason for queues now is the 2 junctions at Warkworth. A 4 lane road is wasteful. The traffic modelling, Bart, is incorrect. It doesn’t include the new trips that the new roading capacity will create. So its time travel estimates are wrong. Do you know whether the modelling was based on a 110kmh speed limit on the Puhoi to Warkworth motorway? This time i have to agree. Duffill Watts and King did a benefit cost analysis of this route 20 years ago and found the b/c ratio was well below 1.0. The difference this time is the modelling assumes a whole bunch of commuter trips that couldn’t exist without the new road. The real problem is the Hill St intersection which nobody had any intention of fixing as the delays there provided much of the justification for building the new roads. No one was going to get any prizes for coming up with a low cost solution. Its the way the consenting process works. You have to go for a Notice of Requirement first – AT will want to maintain flexibility in the future so they go for the max width possible. They justify that width by putting in four lanes and greenwash it with things like “cycle lanes, improved bus services etc” in the business case. Wide road corridor gets approved and then they build whatever they like, most likely a two lane road until such time as they need to widen it in the future. I don’t have any issue with that approach. 10 minutes saving? To get to Warkworth? No way. In free running conditions the new road will barely be faster at all. It’s only in heavy traffic conditions that the new road will make a significant travel time saving. And it’s completely congested at Warkworth now because of the traffic induced by the capacity added on SH1. It will definitely be quicker than the current route is now if you are heading north of Warkworth, however the existing route will likely speed up as well with the reduction of traffic. When you combine this with the motorway coming out a few kms north of Warkworth it is quite realistic the travel time to downtown Warkworth will be just as quick on the old route. You need to show your workings here. The Northern Gateway covers a much shorter route than the old road it bypasses. This isn’t the case with the new section. It has to be open at or before the opening of the new motorway. There’s no alternative I heard. The cross section is appalling for a new road. This is why NZ needs one decent and safe roading standard for the whole country. The surrounding land is proposed to be urban in the future. 1) Thus there should be a flush median to allow safe pedestrian /cyclist movement across the road. Islands can be built where needed/later. The flush median will allow right turns also if there are any properties with frontages. 2) The landscaped border next to the road inhibits pedestrians /cyclists crossing the road & should be removed. 3) The indicative bridge cross section (+flush median ) would be better on the road section, and with the landscaping to the outside. 4) The road corridor looks excessively wide if any if the road corridor has had to be purchased. 6) I fail to see how the cross section will operate at 50kmh. With no parking and no side friction and 4 lanes the natural operating speed will sit at 60 – 70 kmh. If its to be 50kmh it should be designed to 50 kmh. I guess the horse has bolted already for a number of greenfield area developments that then “need” these new roads to support them. Shows the cost of doing this & how much traffic we are going to induce instead of using more densely built areas supported by public transport etc. I guess the positive is this road has proper cycle lanes & footpaths from the outset. Does anyone have the numbers going North as opposed to Eastwards? I would think the North numbers would be higher overall although on a few holiday days the numbers going to the beaches will be more. This would particularly apply to working vehicles.